Do you want more engagement from your social media fans and followers? Wondering what kind of content will help you achieve that goal? New research confirms that photos could be the “holy grail” of social media engagement. In this article I’ll share what you need to know about maximizing engagement on Facebook and Twitter. Photos are the primary type of content posted and shared on Facebook. According to March 2014 research published on eMarketer, photos accounted for 75% of content posted by Facebook pages worldwide. 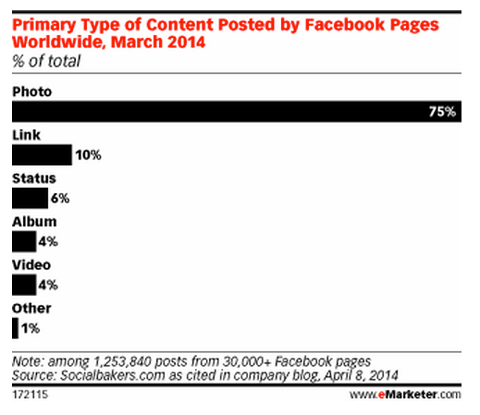 Photos are the main type of content posted by Facebook pages. From a user’s perspective, photos are also the most engaging type of content on Facebook, with a whopping 87% interaction rate from fans! No other post type received more than a 4% interaction rate. 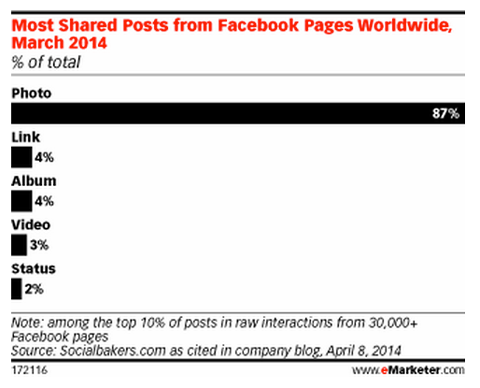 Photos receive the highest interaction from Facebook users. Posting photos on Facebook is the best way to get more attention from your fans because images are easier to consume than text. However, be aware that not all photos are created equal. Not only must you share high-quality photos, you must also share photos that interest your target audience. Only post images that you have created or that you have a right to publish. Post “Caption This” photos – post a funny picture on your page and ask fans to offer their best caption for the photo. One last thing, it may be worth your while to hire a designer or a visual content creator as part of your social media team. 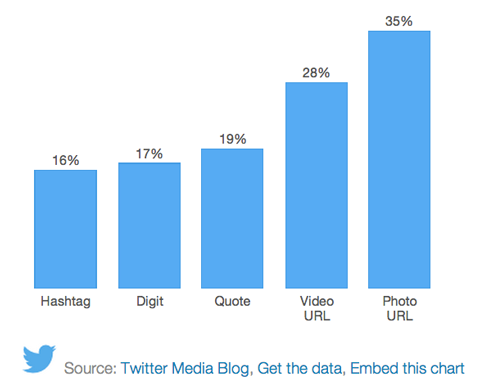 Photos can boost retweets by 35%! Tag people in a photo – Tagging other users makes conversation easy and sharing more likely. You can tag up to 10 people (tagging doesn’t affect the 140-character count on a tweet). Share up to four photos in a single tweet – This is a relatively new feature on Twitter, which allows you to upload multiple photos and automatically create a collage using your iPhone, Android device or straight from Twitter.com. For this to work, you need to download the latest Twitter app. Comments and shares are beginning to overtake likes on Facebook, showing that brands are getting better at engaging with fans. According to the Social Intelligence Report Q1 2014 by Adobe Digital Index, Facebook comments are up 16% compared to the same time last year, and up 40% compared to the same time last quarter. 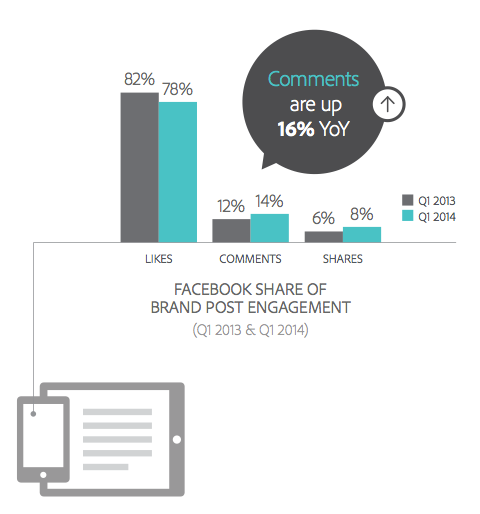 The report also shows that likes have actually gone down from 82% (Q1, 2013) to 78% (Q1, 2014). Fans are commenting more on Facebook pages. Since comments from fans require more time and effort than simply clicking Like, this trend shows that marketers are becoming rather savvy about fan engagement. Fans must be finding content posted by pages interesting enough to invest time and thought into their interactions. If you’re seeing more comments on your page, keep up the good work! But don’t stop adapting. Find different ways for fans to see your content, even via paid posts if necessary. Since Facebook introduced its new comments feature in March 2013, you and your fans are able to reply directly to specific comments on your page. This creates a conversation thread, which ties relevant conversations together. Be sure to reply to ALL comments from your fans, and to like every comment from every user in two ways – as yourself, and as the page. Not only will the user get a notification about the like, which may spur more comments, but it’ll also create a “Ticker” story about your Facebook page. “TGIF” seems to be the theme among Facebook users. If you’ve become skeptical about all of the studies and statistics that claim to have found the best day or time to post on Facebook, take heart. It really depends on your target audience and your type of business. However, the Friday phenomenon is real. Even you know that “the less you want to be at work, the more you’re on Facebook.” These findings are consistent with Facebook data published several years ago, showing that the Happiness Index on Facebook spikes on Friday. So no matter what your business is, consider scheduling Facebook posts to publish throughout Friday and Saturday. Again, this is not the “ultimate guide” for all brands, but it certainly reflects the reality of how users interact on Facebook on a day-to-day basis. 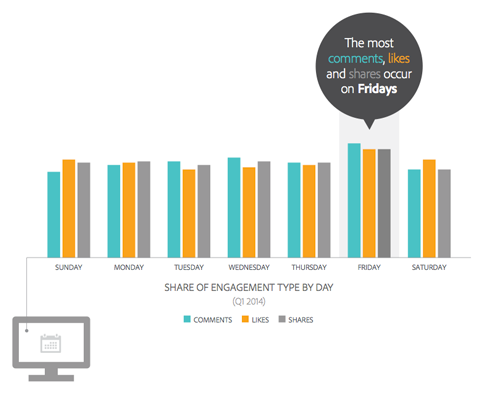 By the way, the same research shows that videos receive the highest engagement rates on Fridays, too. What do you think? Which of these results did you find most interesting? How will you adapt your social media strategy? Share your thoughts in the comments below.